The folks from broadband-expert.co.uk have been asking me for almost a year to talk about their product(s). They feel that MusTech.Net would be a good platform for them because of our large international audience so, after the third request, I decided to do a quick sponsored write-up of the company as many of our readers may find their service quite appealing. Although mobile broadband may be a common term for many of the savvy technical users (or required knowledge of many sales representatives! ), many people still aren’t sure quite what it is. The term mobile broadband describes many different types of high-speed Internet access through a portable modem, telephone device, or other similar communication type of gear. That being said… the term mobile broadband often times refers to the cellular-phone-provider type of broadband Internet connection(s). Broadband-Expert offers 99% of UK coverage, compatibility with any PC or Mac and has plans with speeds up to 7.2 Mb per second starting at £15.00 per month. They also have entry level plans at well under £10.00 per month for those that have less demands. These prices are definitely on par -if not better than many of their U.S. counterparts. Another very interesting aspect of Broadband-Expert is that they have plans that include a laptop with their service that start at £24.47 per month. These plans include the laptop and the 3.6 Mb service. This would be a great way to go if you are a business professional that needs service and likes to upgrade your hardware every couple of years or simply to deal with a 0ne-stop-shop for all of your mobile broad-band needs. There are two criteria that one needs to be aware of when selecting this type of service from any provider: First is the speed of the service, and second (and usually missed) is quantity of the data (usually in gigabytes) that are allowed to be transferred by each contract. Broadband-Expert clearly outlines these details in all of their plans. 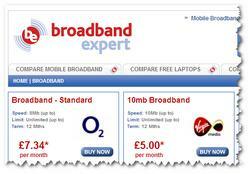 If you are a UK resident and looking for mobile broadband, Broadband-Expert.co.uk is certainly worth a look and very well could be “money in the bank” with regard to savings.